A shoplifter trying to smuggle high-end items out of a San Diego Home Depot used an improvised flamethrower to ward off employees while his wife and baby waited in a getaway car outside, San Diego County Sheriff’s investigators told NBC 7. 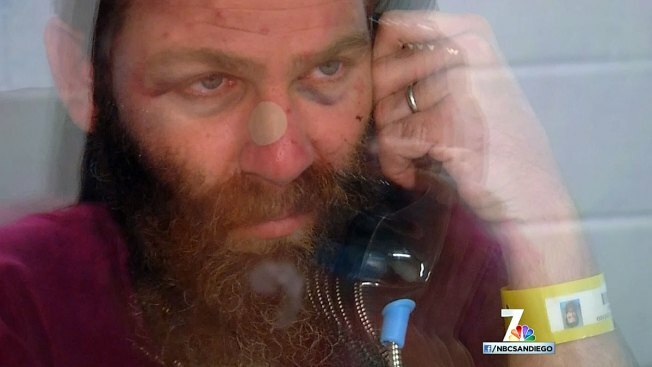 Ignacio Lorenzo Brambila, 37, of Lakeside told NBC 7 in a jailhouse interview Monday that he does not remember a lot of what happened Saturday night around 10 p.m., when he allegedly went to the Home Depot in the 12000 block of Tech Center Drive in Poway. "Things just kinda went, went a little the wrong way," said Brambila. "Things didn't happen right. I mean, everything that got put on me and [his wife]-- I think they try to put anything they can on you, everything they can on you." With nose bandaged and eyes black and blue, Ignacio Brambila agreed to a jailhouse interview with NBC 7 on Sept. 8, 2014. Sheriff's department spokesperson Jan Caldwell said Brambila was pushing a stroller, and he put expensive tools from the store in it. As Brambila neared the exit, workers noticed the suspect had equipment, not a baby, in the stroller and confronted him. Poised with an aerosol can and lighter in hand, Brambila sprayed the flammable contents over the flame, creating a "street flamethrower" in a large fiery blast aimed at the workers, Caldwell said. The employees backed off, and Brambila ran to the parking lot, authorities say. There, his wife of 17 years, Sarrah Brambila, 34, waited in a vehicle with their 18-month-old child in the backseat, according to Caldwell. The trio sped off, but just a few blocks away, deputies caught up with their vehicle and arrested the Brambilas. Caldwell says deputies found the stolen tools in the back of the vehicle. "This is different — to do something as brazen, to go through a store and just put things in a baby stroller, and then to walk out as though they own the place," said Caldwell. Child Protective Services took the baby and the couple’s 12-year-old twins, who were not with them at the time, into protective custody. With black and blue eyes, Brambila claimed Monday that four or five inmates beat him up because they found out he was accused of child cruelty -- something the suspect adamantly denies. "I've never placed my children in harm's way on purpose, or I don't see how they were -- any of them," said Brambila. Despite our questions, he did not address the other charges against him. Brambila, a roofer, was booked into jail on charges of robbery, assault with intent to commit a felony, conspiracy to commit a crime, child cruelty and being under the influence of a controlled substance. Sarrah, who has an active registered nursing license, was held on charges of robbery, conspiracy to commit a crime, child cruelty and assault with intent to commit a felony. NBC 7 has reached out to her for an interview but have not heard back. Both suspects are being held on $100,000 bail and are scheduled to be arraigned on Wednesday. It's unclear if they have attorneys. Detectives are trying to determine if they are connected to other crimes.